On Monday, Matt Adams broke a scoreless tie with a two-run homer to beat Pittsburgh and last night it was Kolten Wong’s turn. 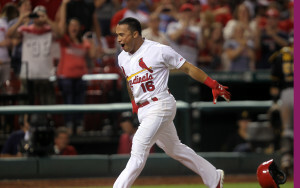 Wong hit a 3-2 pitch 420 feet over the right field wall off Ernesto Frieri to give the Cardinals a 5-4 victory. The homer was Wong’s third of the season. Wong also gave the Cardinals the early lead with a two-run double in the second. Pedro Alvarez and Andrew McCutchen hit two-run homers off Carlos Martinez, in the fourth and fifth innings, as McCutchen’s 14th of the season put the Pirates up 4-2. 14 of Alvarez’ 100 career homers have come against the Cardinals. Matt Holliday, in a 2 for 14 slump, doubled in two runs to tie the game in the fifth off Pittsburgh starter Vance Worley. With their loss to Philadelphia, Milwaukee’s lead is down to three games in the Central over the Cardinals, who are 1/2 game up on Cincinnati and 1 1/2 up on Pittsburgh after these two wins.